Annual General Meeting: There will be a brief annual meeting before our regular meeting tonight. Note the earlier start time at 7:00 pm. 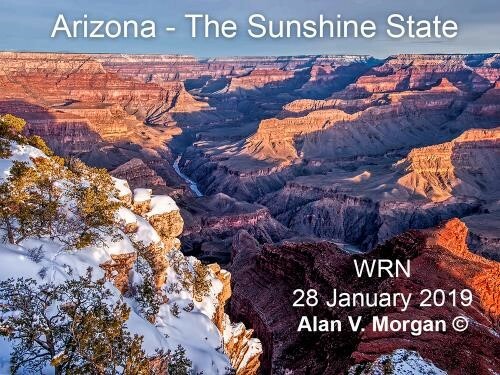 The Presentation: Join Alan and Anne as they concentrate on many aspects of this southwestern American State, but also touching on some neighbouring areas. This illustrated talk will take you through a number of the truly spectacular National Parks, such as Anza-Borrego, Joshua Tree, the Petrified Forest and Painted Desert, the Grand Canyon, Bryce and Zion. The Presenter: Alan Morgan is a retired professor of Earth and Environmental Sciences at the University of Waterloo. Since retirement Alan, and his wife Anne, have been lucky enough to travel extensively, combining their shared passions for geology, geography, travel, animals, plants, history, and photography. Most recently they have made a number of trans-continental forays in an all-electric car.